St. Joseph Catholic School, located in Madison about a mile west of the Interstate 55-Mississippi 463 exit, was founded in 1870 in Jackson by the Sisters of Mercy. The school will celebrate its 150th anniversary in 2020. St. Joe offers a seventh- through 12th-grade education with a rigorous college prep curriculum grounded in the teachings of the Catholic Church. St. Joe is accredited by AdvancED and overseen by the Catholic Diocese of Jackson. Here is a look at St. Joseph Catholic School’s 2019 spring musical. THE THEATER: The play will be staged in the St. Joseph Fine Arts theater, 308 New Mannsdale Road in Madison (click here for a Google map). THE DATES: Curtain is 7 p.m. Thursday, April 11; Friday, April 12; and 7 p.m. Saturday, April 13. Saturday also will have a 2 p.m. matinee. ADMISSION: Tickets are $10 each with St. Joe students admitted free. St. Anthony, St. Richard and Sister Thea Bowman Catholic School students admitted free if they wear a school shirt. 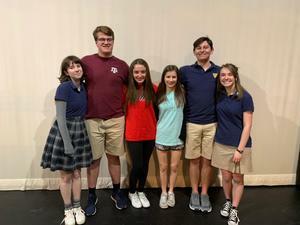 The lead actors and actresses in “The Wizard of Oz,” St. Joseph Catholic School’s spring musical. The musical opens at 7 p.m. Thursday, April 11. Other performances are 7 p.m. Friday, April 12, and 2 p.m. and 7 p.m. Saturday, April 13. The play will be performed live on stage at the St. Joseph Catholic School Fine Arts theater, 308 New Mannsdale Road, Madison. Pictured are from left: Alice McPhail, a senior, the Scarecrow in the Ruby Cast; Wyatt Davis, a junior, the Cowardly Lion in both casts; Mary Grace Stewart, a junior, Dorothy in the Ruby Cast; Annalise Rome, a junior, Dorothy in the Emerald Cast; Lake Dodson, a junior, the Tin Man in both casts; and Hannah Dear, a junior, the Scarecrow in the Emerald Cast.